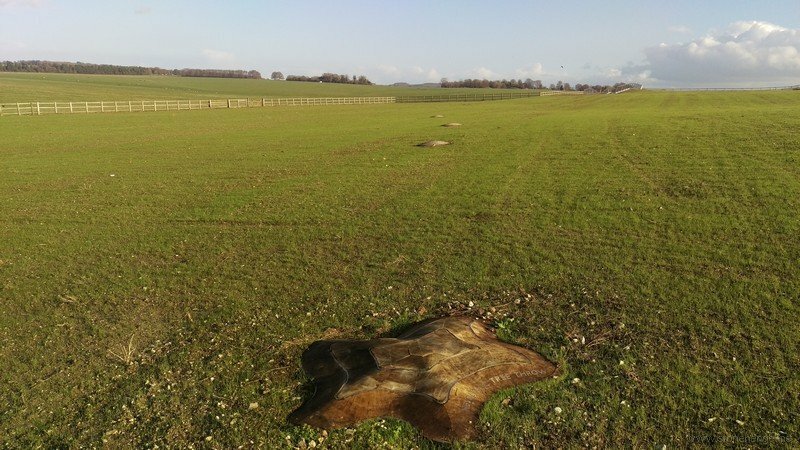 "...Paul Sample, a former mayor of Salisbury, has attacked the scheme as a “cheap and nasty” addition to the World Heritage Site; while Peter Alexander-Fitzgerald, a member of the International Council on Monuments & Sites, claimed the centre resembled “a derelict aircraft hangar”. Sample said: “It’s cheap and nasty and isn’t going to do justice to the site. It looks like an immigration detention centre. 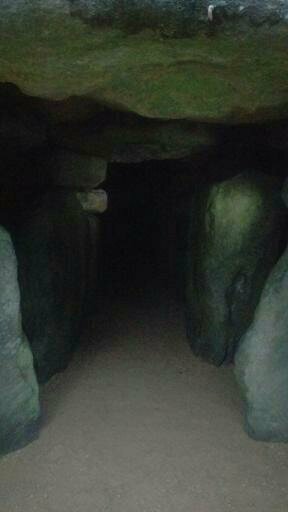 It’s not something that makes you feel part of something ancient and mystic. Alexander-Fitzgerald commented: “This looks like an IT student’s first attempt at rendered graphics. 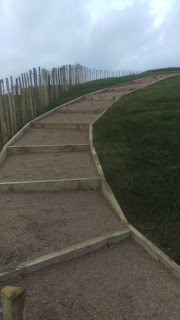 It’s amateurish and causes one to wonder about the quality of the finished product." 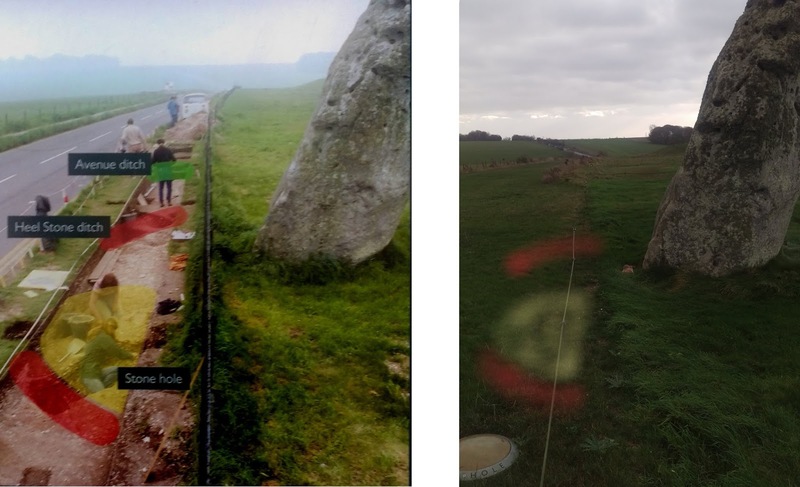 English Heritage have just finished a modest restoration of West Kennet Long Barrow - new drained floor, restored worn areas and replacement of the skylights with a more sympathetic arrangements of simple circular lightwells. They seem to have done a very good job as my poor photos taken in the dusk of a murky day show. 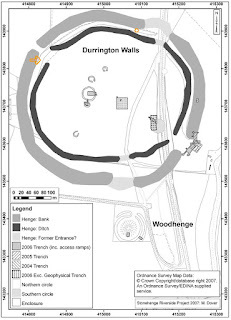 I was told that a sarsen stone had been spotted in a hole at Durrington Walls, and especially with the interest in the “Superhenge” idea of a row of buried stones under the bank there I thought a walk round was in order. 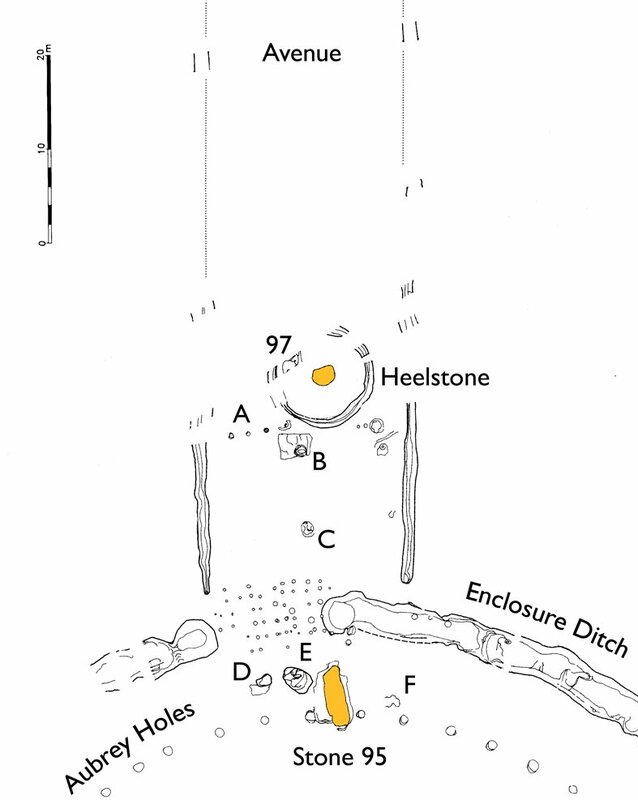 The reported stone is on the north side whereas the “Superhenge” row is on the other side, under the southern bank. 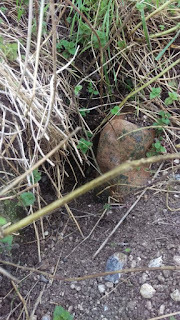 And whereas they are believed to be large monoliths (or not stones at all in the competing hypothesis) this stone is quite small. 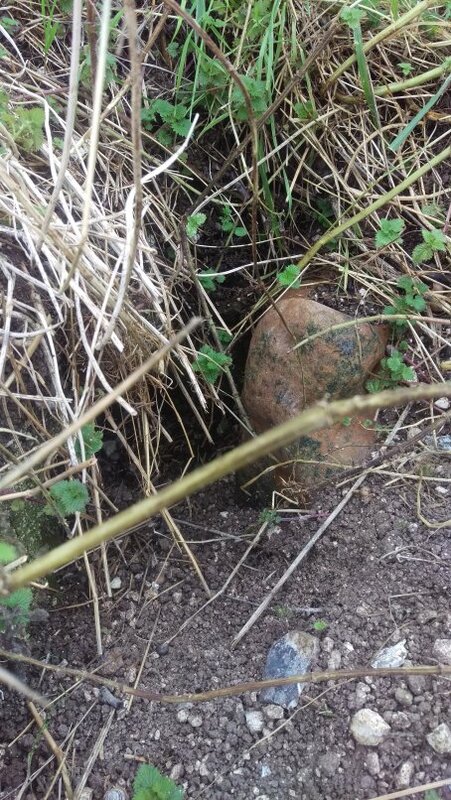 It is stuck fast in the ground but moves slightly on touch and I would estimate from the angle of movement it is about 60 cm in length at most. It is dark reddish colour, rounded and unworked as far as can be seen and is typical of the smaller local sarsens. 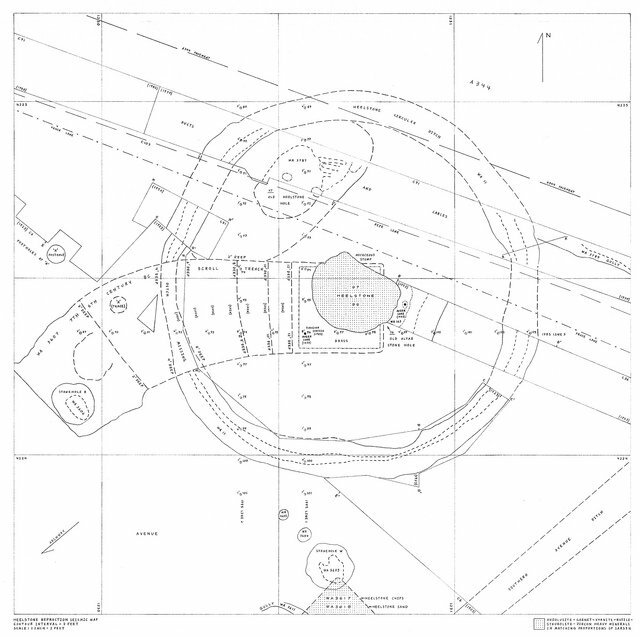 I have indicated its position with a circle on the photo and plan. 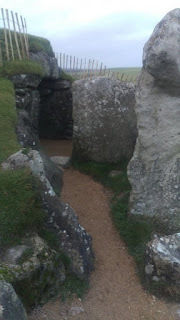 This area of the scarp seems quite free of modern debris but because of badger and rabbit damage the stone could easily have been deposited there at any time and then buried. 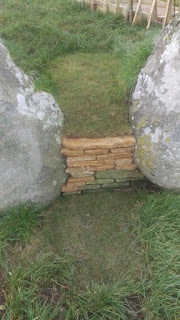 It is the sort of stone a ploughman would have carried to the edge of a field and tipped onto the waste ground of the scarp. Further to the west there is a disputed entrance to the henge at the head of the valley up though the monument. 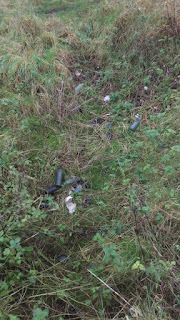 As you walk round the scarp to this area the scarp becomes increasingly contaminated with what looks like early 20th Century rubbish, bottles, ash, some metal etc. 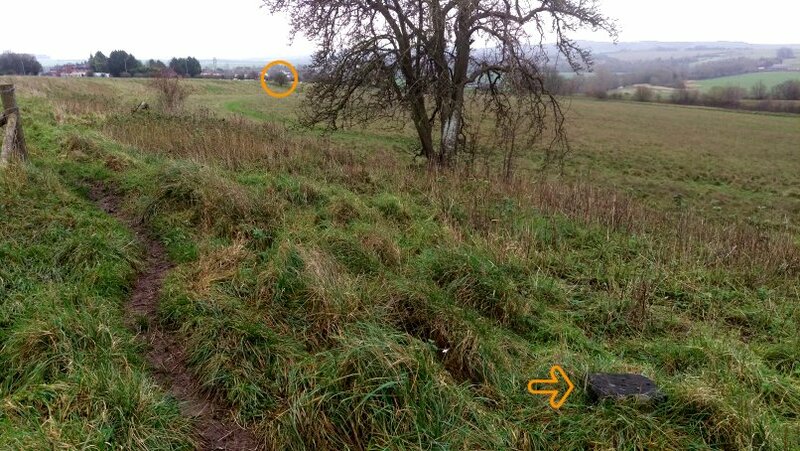 Where the entrance might be there is a War Department concrete marker, marked with an arrow. 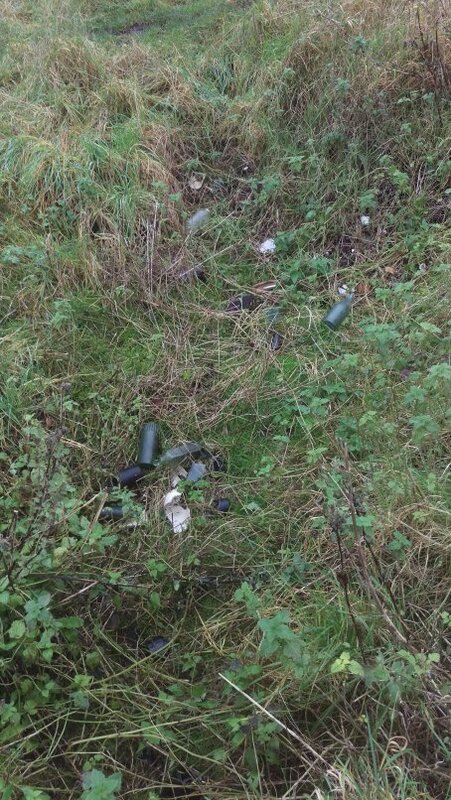 It is obvious that this area was used as a rubbish dump and the shape of the scarp is altered by the accumulation of the rubbish. At the top of the entrance there seems to be a shallow hollow way towards Larkhill though the ground is very disturbed with animal holes and other field marks. It would be great if the original features could be recovered from under the rubbish. "Earth scientists who have worked at a "bluestone monolith quarry" site at Craig Rhosyfelin in Pembrokeshire have suggested that the archaeologists have got it all wrong, and that the so-called "engineering features" on the flank of the crag are entirely natural. 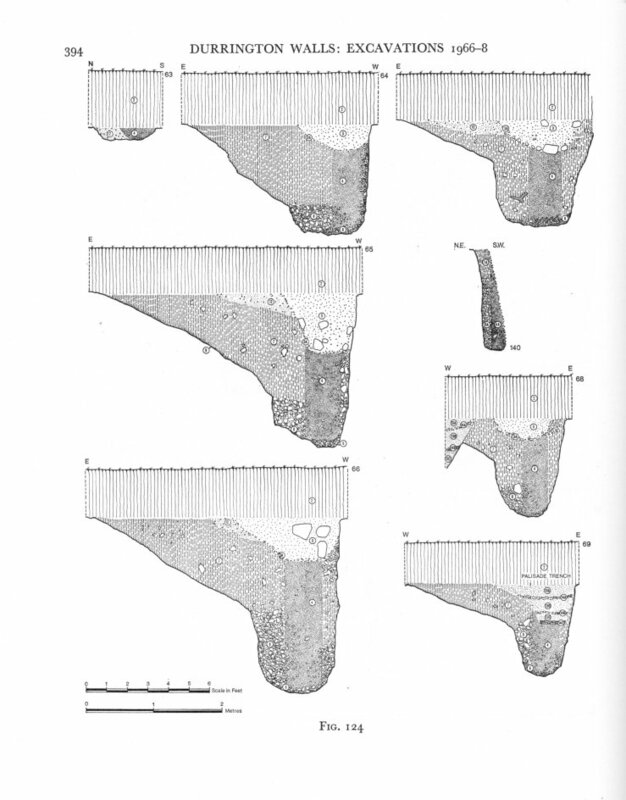 Further, it is suggested that members of the digging team have unconsciously created the very features that they have cited in support of their quarrying hypothesis. 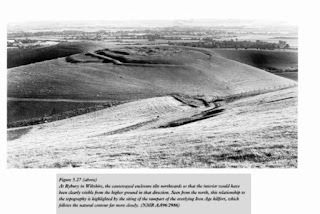 In a peer-reviewed paper published on 14th December 2015 in the peer-reviewed journal "Archaeology in Wales" journal Dr Brian John, Dr Dyfed Elis-Gruffydd and John Downes have described a set of Ice Age deposits and landforms at the site of an archaeological dig that was started in 2011, and have determined that there are no traces of human intervention in any of the features that have made the archaeologists so excited.... "
This research can be freely downloaded from Researchgate, and is also available from the journal office in hard copy. 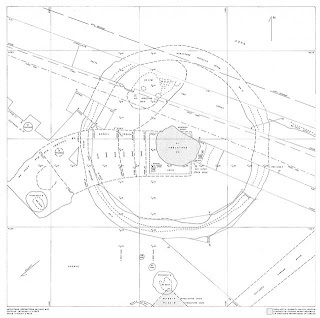 JOHN, B.S., ELIS-GRUFFYDD, D. & DOWNES, J. (2015b). 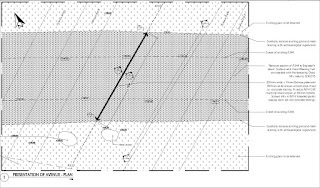 Observations on the supposed ‘Neolithic Bluestone Quarry’ at Craig Rhosyfelin, Pembrokeshire. 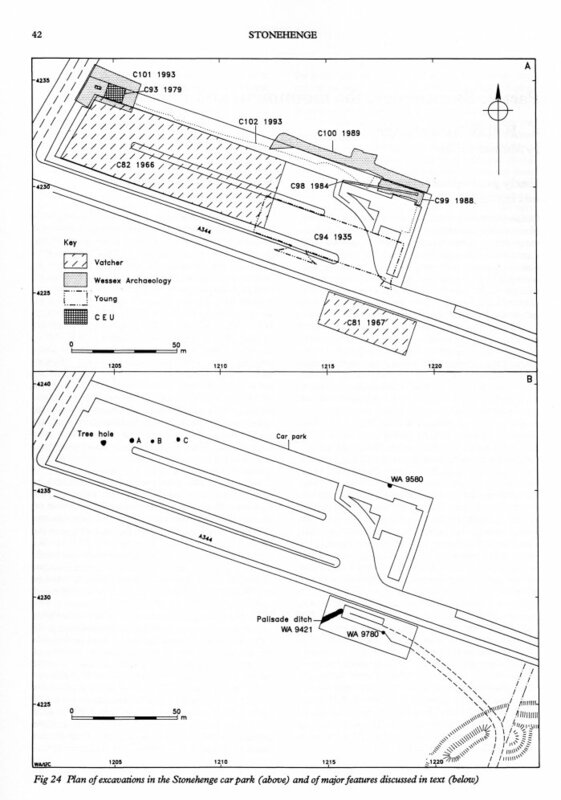 Archaeology in Wales 54, pp 139-148. Another archaeologist, and I can't be sure who it wa, mused to me about whether Stone 56, the tallest sarsen stone at Stonehenge was a reused stone some time ago. The fact what is now the buried portion of the stone is as finely worked as the rest was a factor in his suspicions. Vehicle arrived in Kathmandu Valley up the mountain passes from Bhimphedi on the back of porters. There was no motorable road into the valley and inside it there were just a few kilometers of road wide enough for driving up and down Kathmandu and Patan. The Rana rulers of Nepal started importing vehicles for their own use and for the use of the King. The first car was imported during the time of Chandra Shumsher at the turn of the last century. The Mercedes Benz gifted by Adolf Hitler to Maharajah Juddha Shumsher in 1939 A.D., part of a diplomatic overture to influence Nepal to stay out of WWII, was also carried in this manner to Kathmandu. 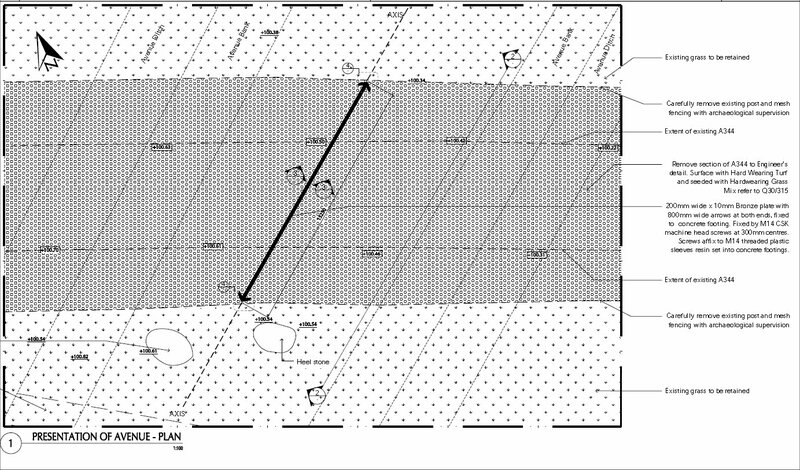 A team of archaeologists and geologists working in Wales have found two of the quarries that provided stones for Stonehenge. 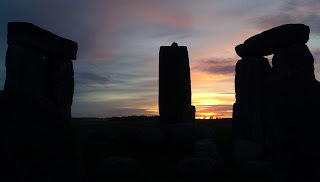 The very large standing stones at Stonehenge are of ‘sarsen’, a local sandstone, but the smaller ones - known as ‘bluestones’ - come from the Preseli hills in Pembrokeshire. 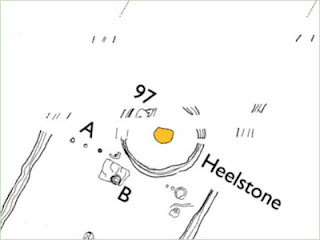 Geologists have known since the 1920s that the bluestones were brought to Stonehenge from somewhere in the distant Preseli Hills, but only now has there been collaboration with archaeologists to locate and excavate the actual quarries from which they came. 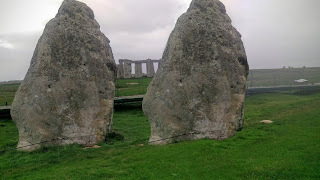 The Stonehenge bluestones are of volcanic and igneous rocks, the most common of which are called dolerite and rhyolite. 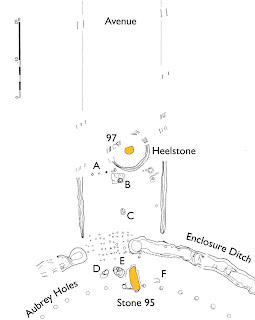 Richard Bevins of the National Museum of Wales and Rob Ixer, honorary senior researcher at UCL and University of Leicester, have identified the outcrop of Carn Goedog as the main source of Stonehenge’s ‘spotted dolerite’ bluestones and the outcrop of Craig Rhos-y-felin as a source for one of the ‘rhyolite’ bluestones. 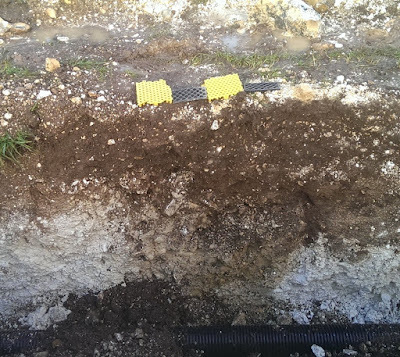 Archaeological excavations at both sites have uncovered evidence of prehistoric quarrying. 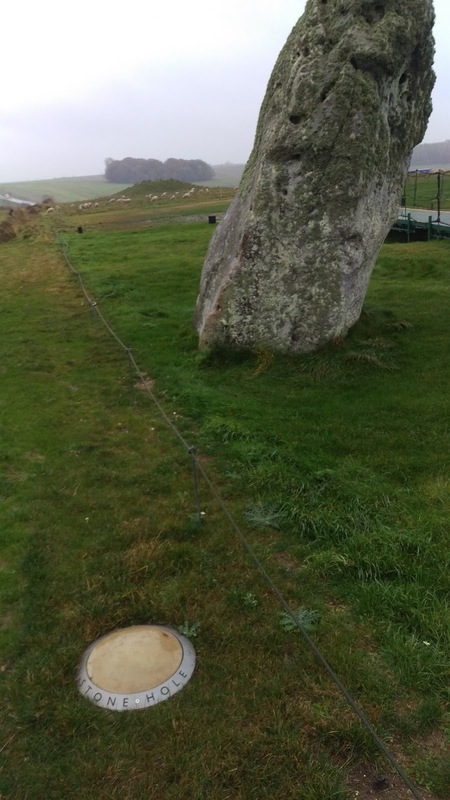 Phil Bennett, archaeologist for the Pembrokeshire Coast National Park, said: “This project is making a wonderful contribution to our knowledge of the region’s importance in prehistory.” The new discoveries may also help to understand why Stonehenge was built. 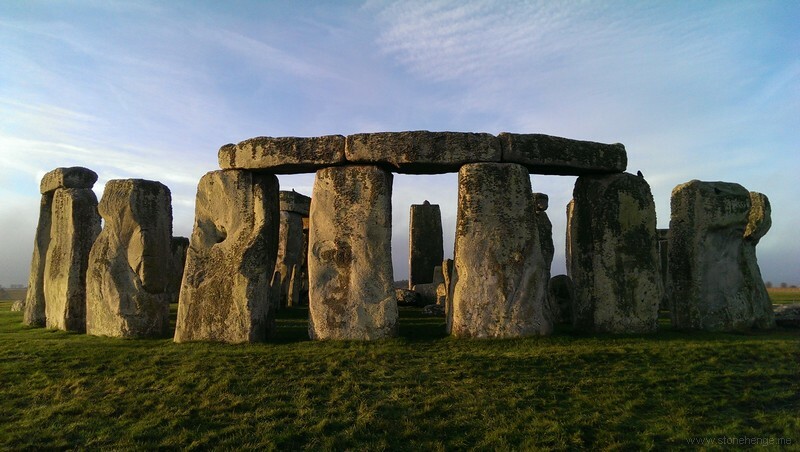 Parker Pearson and his team believe that the bluestones were erected at Stonehenge around 2900 BC, long before the giant sarsens were put up around 2500 BC. 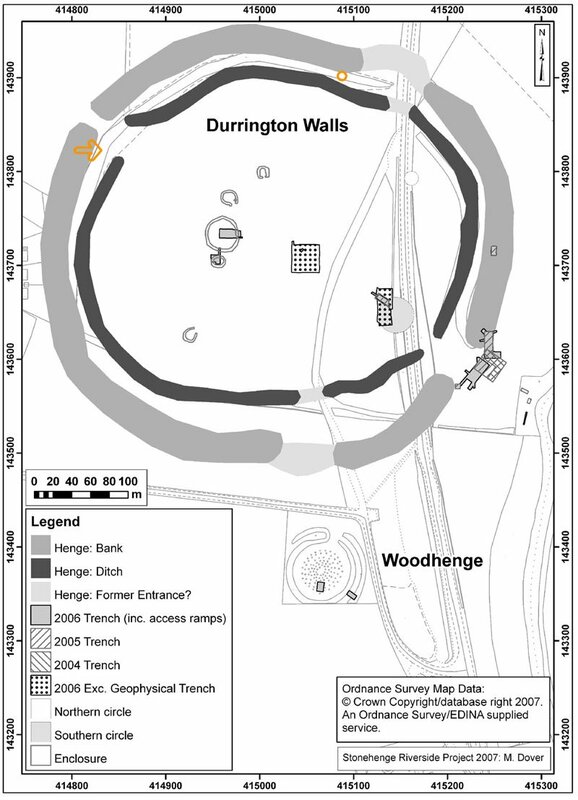 “Stonehenge was a Welsh monument from its very beginning. If we can find the original monument in Wales from which it was built, we will finally be able to solve the mystery of why Stonehenge was built and why some of its stones were brought so far”. 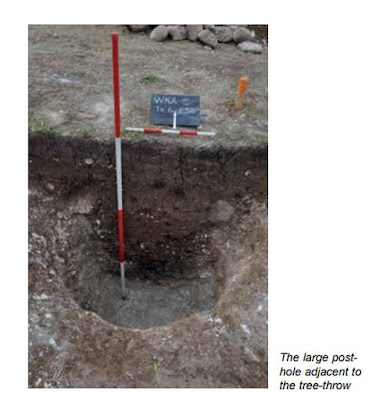 The project’s results are published this month in the journal Antiquity and in the January issues of British Archaeology and Current Archaeology. It also features in a new book published this month by the Council for British Archaeology, Stonehenge: making sense of a prehistoric mystery. 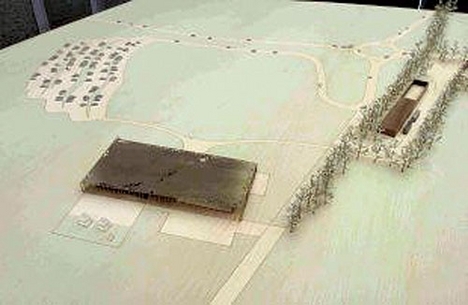 Further excavations are planned for 2016. 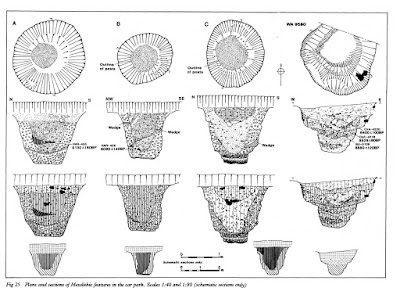 The project is led by Prof. Mike Parker Pearson (UCL), Dr. Richard Bevins (National Museum of Wales), Dr. Rob Ixer (UCL and University of Leicester), Dr. Josh Pollard (University of Southampton), Prof. Colin Richards (University of Manchester), Mr. Duncan Schlee (Dyfed Archaeological Trust) and Prof. Kate Welham (Bournemouth University). It has been funded by the National Geographic Society, the Society of Antiquaries of London, the Royal Archaeological Institute, the National Museum of Wales and the Cambrian Archaeological Association, with support from the Pembrokeshire Coast National Park. 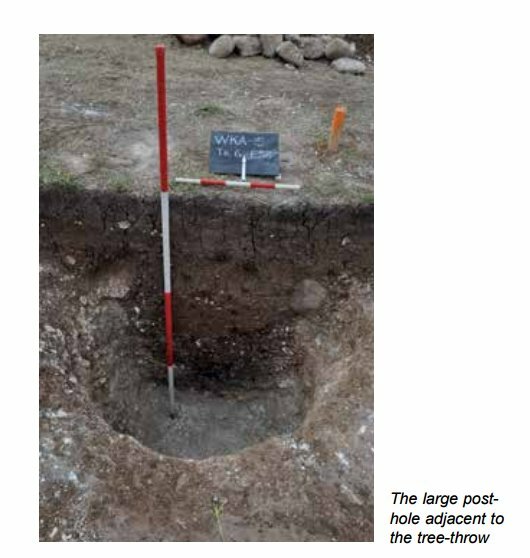 I have a belief that many postholes held inverted trees - just a belief, no evidence - so I was interested to see the posthole Josh Pollard et al excavated on the West Kennet Avenue near to Avebury which was in a tree throw hollow and maybe was that tree being resurrected, maybe upside down. 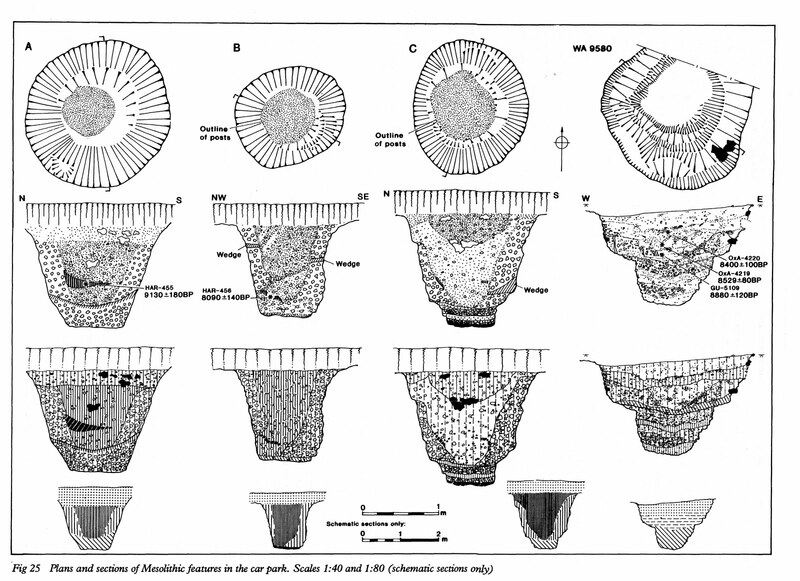 This is just a few brief notes I have made on other posthole shapes for my further rumination.
" 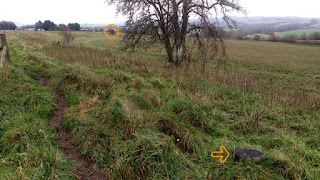 Inverting the central tree"
The new posthole markers (tree throw marker to fore). No ramps and a tree throw. Pine charcoal in pit A HAR-455 dates 8800-7790BC. 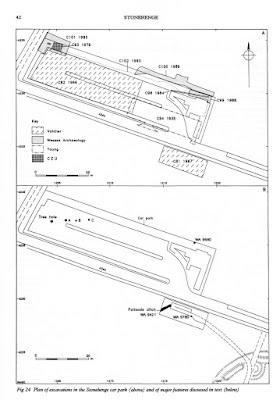 Pine charcoal in pit B HAR-456 dates 7490-6640BC. 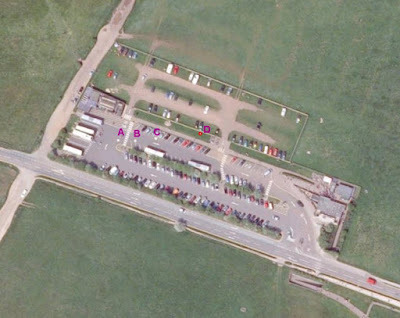 Spot marked D is an unreported disturbance spotted in a trench during the restoration of the carpark to grassland.